Summary: The movie opens with Lara Croft (Angelina Jolie) on a treasure hunt to find an orb that once decoded, is a map to Pandoras box. Once the orb is in her grasp, a group of bad guys steals it from her and leaves her to die in the underwater cave where she found the orb. They also kill her partners for good measure. Meanwhile, a really, really bad guy Johnathan Reis (Ciaran Hinds) has arranged to purchase the orb from the first group of bad guys. Predictably, he gets the orb from them, kills them and screws them out of their finders fee. He plans to use the map to find Pandoras box and sell it to third group of bad guys who apparently want to open the box and release a plague onto all of humanity. Only those with the anti-virus serum will survive. So, the adventure begins. Lara steals the orb from the really, really bad guy before he can decode it. Then, she decodes it herself and unwittingly leads the really, really bad guy straight to the box where we VERY predictably see him die a horrible death (all really, really bad guys seem to die horrible deaths in the last 15 minutes of the movie). 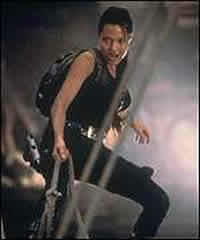 The world being safe once again, Lara leaves the box behind and the movie ends. Roll credits. That is what the movie boils down to. Sure, there are other characters but they bring nothing to the plot. It may sound like I didnt like the movie. Actually, I did. I could watch Angelina Jolie bounce around in skin-tight outfits every day. In fact, they could have replaced the dialog in this movie with the theme to Baywatch and it would have been every bit as enjoyable. And, lets be honest, forget about Pandoras box. I am far more interested in Crofts. Unfortunately, the rating kept us, once again, from seeing Lara Croft naked. To determine whether or not you should watch this movie, answer the following three questions: 1 - Am I a straight male? 2 - Am I bored enough to see a movie? 3 - Do I have access to 8 bucks? If you answered "yes" to these three questions, this is the movie for you. PLEASE NOTE: All reviews on this site are the entire property of MOVIE NET they may not be taken from this site for any reason other than to read yourself or show others, that does not include posting it on another website, or taking it to put into any other form of media printed or otherwise. The reviews have been written by the person they are creditied to, and so you cannot take them and pass them off as your own work. NO part of any review may be taken and used in any way without the permission of MOVIE NET. Failure to obey these conditons will result in us taking action against you.